Welcome to Laurel Hills in Pigeon Forge! 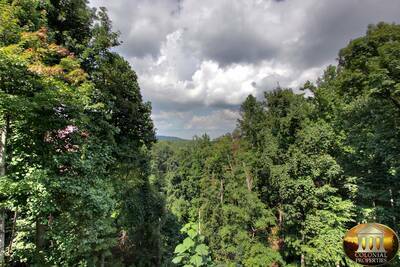 This breathtaking 3 bedroom, 2 bath Smoky Mountain vacation rental offers you and your guests a lovely setting to enjoy the Smoky Mountains. The super cozy and comfortable open concept living area provides you with natural wood accents, a fireplace, plenty of windows to let in the light, a Foosball table for challenging your guests and a great open flow right into the kitchen and dining area. You'll love the dining table and fully equipped kitchen that is the perfect place to share a delicious meal with your family and friends while on vacation in the Great Smoky Mountains. Located on the main level of Laurel Hills are two bedrooms that are certain to provide you the perfect space to enjoy some much needed rest and relaxation while staying in Pigeon Forge. Each bedroom offers and queen bed and access to a shared bathroom. This half bath with sink and toilet offers a delightful feature for your guests. Here, they can soak and relax in the jetted tub for a soothing and serene experience. Venture upstairs and you’ll enter the loft area that overlooks the living room below. Here you will find a futon for added sleeping space or just a quiet place to curl up with a good book. On the upper level you’ll also find an additional bedroom with a queen bed and nearby full bath for added privacy. If you love being outdoors, then you'll love relaxing on the deck in the bubbling outdoor hot tub. Beneath the covered gazebo on the deck you can soak in the hot tub, enjoy the porch swing or take in the wooded view while sitting in the rocking chair. 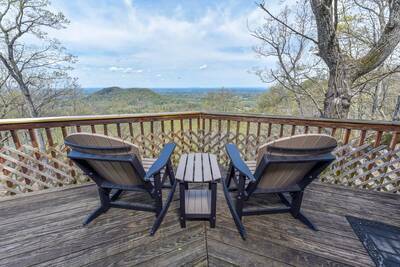 When you’re planning a peaceful vacation to the Smoky Mountains, look no further than Laurel Hills in Pigeon Forge! With its amazing setting and relaxing atmosphere, you and your guests are sure to enjoy all of your time in this mountain getaway. Contact us today to plan your stay! A: It is not rated as a handicap accessible property. 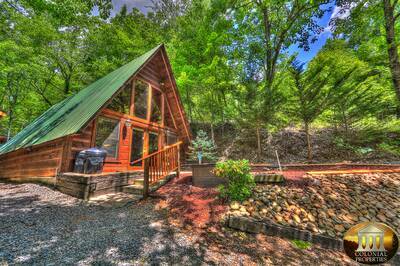 “ Our family had a wonderful time.the cabin was exactly as described. We are already looking for our next colonial properties cabin ( next one needs a view). “ The drive was very scenic my Grand daughter was in love .The cabin itself was AMAZING clean an relaxing. Wish we could of stayed longer we really enjoyed everything about the cabin .It was Quaint Beautiful an relaxing! Would definitely stay there again an have told all my friends about our stay .Thank you so much for the relaxation!! “ Beautiful cabin and very cozy. Very quiet and clean. Would love to visit again. “ The cabin was great clean felt like home , we really enjoyed our trip viewing the mountains and all the activities we did this is our second year in a row thinking about a Christmas trip this year to sum it up it was awesome, thanks for an unforgettable trip. “ This was the first time we ever rented a cabin. We wanted to do something different for this trip with less work getting ready for road trip. This location was really nice and convenient to all locations we were looking for. This trip put us half way for meeting up with our son and his family. “ Very nice. Love relaxing on swing while others in hot tub. TVs & games for evenings kept kids busy. Drive was a little scary. 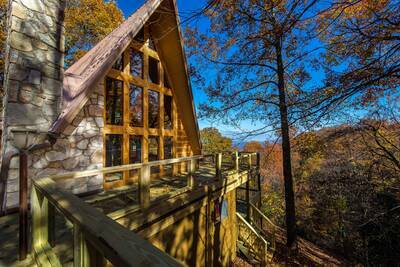 “ This cabin was amazing!! It had everything we needed and very clean. 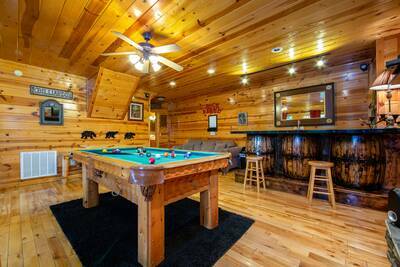 “ Staying in the cabin is really a wonderful time for our entire family. We can all be together for our meals and spend time in the evenings just sitting around talking, playing games or watching tv. We did get to see 3 bears who visited our cabin, a mother and 2 cubs. My daughter actually got it on video. That was great! Being in the Smokies is so surreal and we are blessed to be able to be here. So spend your time wisely with your own family and enjoy the peace and serenity that is right here for you. God bless. “ We would like to say our stay was wonderful and everything was clean and our family enjoyed staying as much as we did. Everyone was friendly and very helpful. We just wanted to thank everyone at Colonial Properties for making our wedding weekend a wonderful experience and we will be using them in the future. “ We stayed on a family vacation and the Cabin was great! looked just like the pictures shown and very clean! we will come back to Colonial Properties the next time we are back in Gatlinburg!